In its fully revised second edition, this book is devoted solely to the study of sociodrama, a group learning process that provides practice in solving problems of human relations through action while uncovering the commonalities among people, allowing the thoughts, feelings, and hopes of all who participate to rise to the surface. This insightful guide helps participants in group work to come to a new understanding about themselves, each other, and the world at large by providing a living laboratory for practicing new and more satisfying ways to approach problems, clarify values, express feelings, and practice new behaviors. The theoretical and practical guidance offered in this book will help management and staff trainers, educators, psychotherapists, sociologists, theatre artists, pastoral counselors, and others in or planning on joining the help professions to provide a vital modality for energizing even the most passive groups. The expanded and revised second edition begins by showing the reader how to structure sociodrama sessions, how to facilitate the accomplishment of group goals through action, and how to avoid some of the pitfalls of sociodrama directing. It also includes the historical and theoretical foundations of sociodrama so that the practice of sociodrama can be placed in larger context. The second part of the book focuses on the use of sociodrama in a variety of settings, including the work place, the school, the political arena, psychotherapy, and spiritual settings. This section also provides methods of marketing sociodrama and essays by other well-known sociodramatists from around the world. 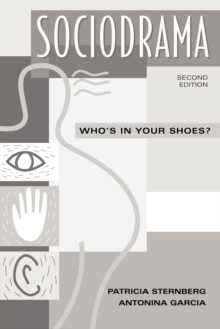 Students, scholars, and educators in the social sciences and the arts, as well as business professionals, will find Sociodrama: Who's in Your Shoes? an invaluable guide to this effective learning process.